This video shows you how to wire auxiliary reverse lights so that they come on when you put the truck into reverse. I know wiring scares some people but it really isnt that bad. Let me know what you think of my setup! Last edited by Redneckstone; 10-10-2014 at 11:57 AM. Go big or dont go at all haha. I def get what you are saying and I am still debating if I should keep them there or have them facing forward. I really want a light bar to put on a headache rack. I am still trying to figure out if 50in is too big for our trucks. Haha, yea man this is me. I wanted to show people how to do this the right way so they dont light their rig on fire! I make sure all of my videos are done the right way! Wow, that was a great video! Very informative and should make this mod (when I get around to doing it) 10000x easier! Great vid watch all of yours and their all good. 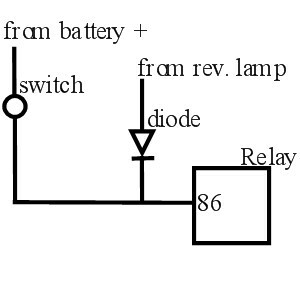 I like this one because you showed how to wire a relay. Which I didn't know how.. Thanks man! I am going to do a video just about how a relay works and show the inside of one I cut apart! Any updates on that tire shine? Is there a way to have the reverse lights also connected to a switch in the cab? Yes, this slight modification to Chris' wiring diagram should do it. 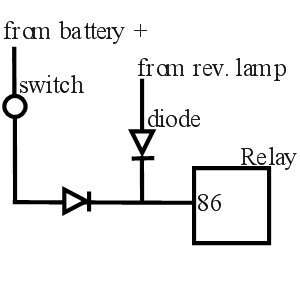 The switch sends power to the relay pin 86, and/or the reverse lamp sends power to pin 86, so the relay coil gets energized from either source (or from both). The diode prevents your switch from sending any power to the reverse lamps, cuz you don't want your switch to affect the factory reverse lamps. Great video, you should make one for front auxiliary lights, I think it will safe many people from headaches. The tire shine still looks 90%. I am quite impressed. I am updating how it looks in the description of the video every month so you want monthly updates, check that out! Thanks! I am planning on making a video for front lights. I am just trying to figure out what 40in light bar to get. Yes there is and you need a diode to prevent the aux reverse light current from turning on your stock reverse light. Thanks for the explanation. What size diode for a setup like in the video? Anyone know the location and color of the interior wire for the reverse lights for a 2005? I have heard brown and it is in the passage foot panel. Anyone able to confirm that? 2005 fx4 level 2 ranger: ohc console, mustang dome light, aftermarket deck, hvac red, cluster red lighting, painted the interior, front bumper black, blacked out grill, red mesh behind grill, blacked out fender flares, HID conversion, cranked t-bars, rear emblem red, tow hooks red, rock guards red. The relay's coil uses only 150mA, so any ordinary 1/2 watt (or 1W) diode will do fine.